Happy Boxing Day to those of you celebrating today! I myself am at work after two days off for Christmas Eve and Christmas Day. The weather is rather overcast (of course it is; I put on a holo polish last night), and I've got a cough/cold that I've been battling for two weeks now, so to cheer myself up I took a break and was looking through my nail photos from this year to start coming up with my Top 20 for 2013. 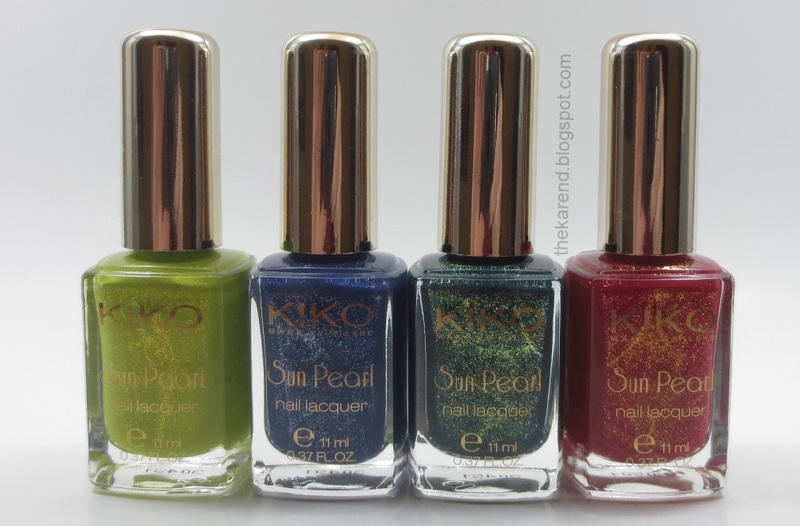 In the process, I found some Kiko swatches from last summer that I never posted, probably because I was so excited about the Sugar Mat polishes I'd gotten from my swap buddies that I got distracted. These non-textured Kiko colors deserved better from me, so today they'll get to see the light of the internet; better late than never, I suppose. 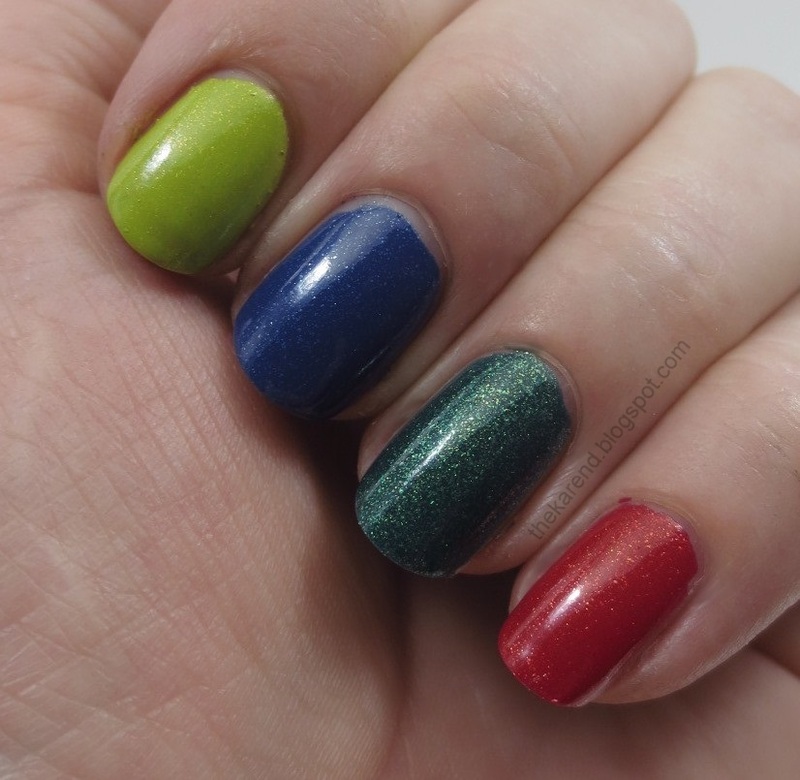 First up, I have four colors from the Sun Pearl collection, which I believe was limited edition for this past summer: 427 Amable Chartreuse, 429 Blue Spot, 428 River Green, and 430 Chili Pepper Red. Those names do a pretty good job describing the colors; too bad they don't show up on the bottles anywhere (I had to look them up online). 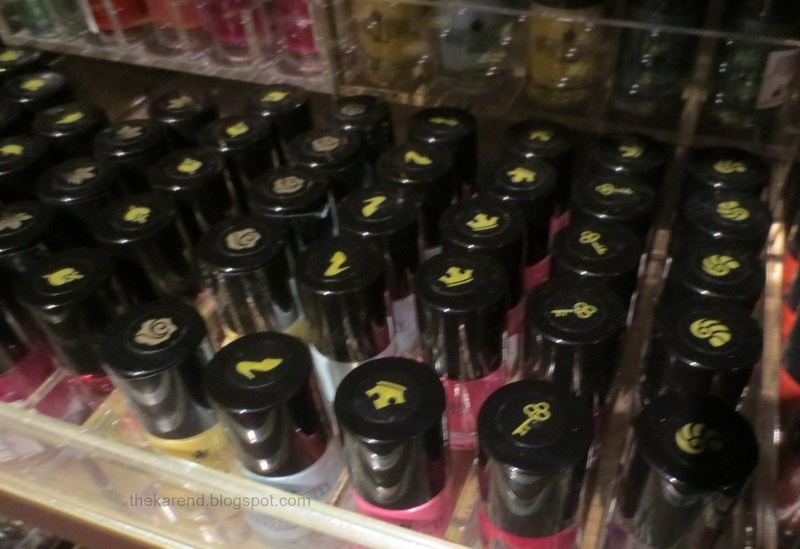 I did Skittles with these colors, index to pinky in the same order as the bottles above. Even though I swatched these four months ago, I did manage to find my notes about them—only to discover that I hadn't written down how many coats I used. I guess I was distracted by those Sugar Mats. 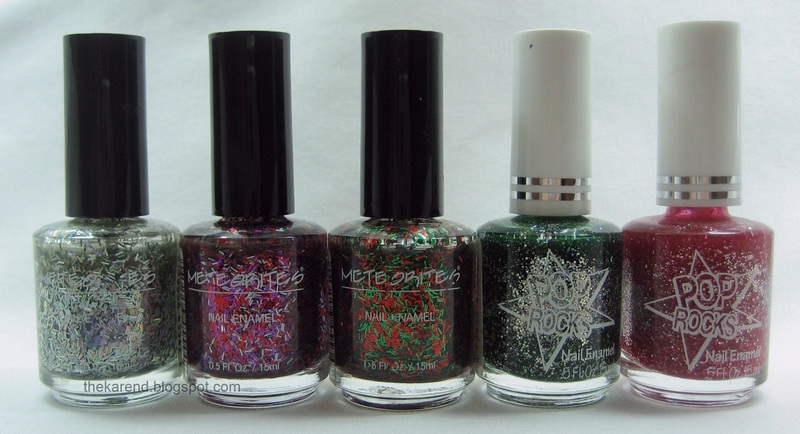 These are all flecked shimmers, with River Green being the most shimmer-packed. 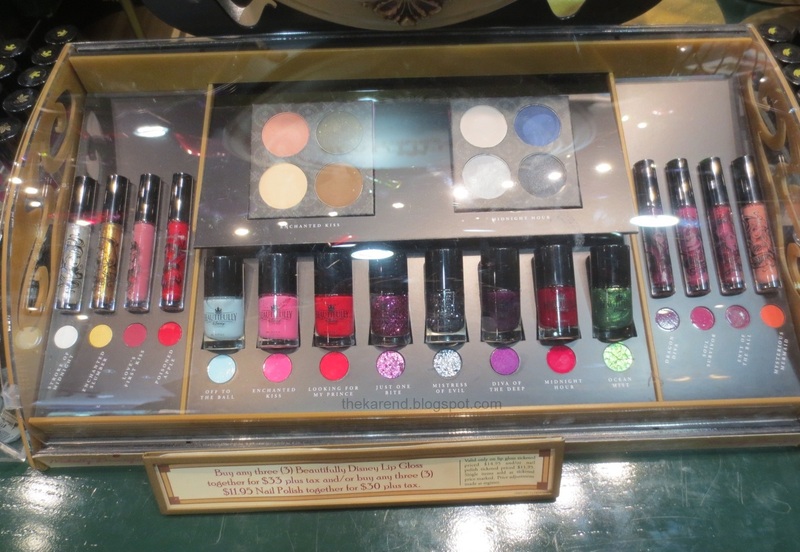 Kiko didn't just dump the same shimmer in all of these; each color is different. 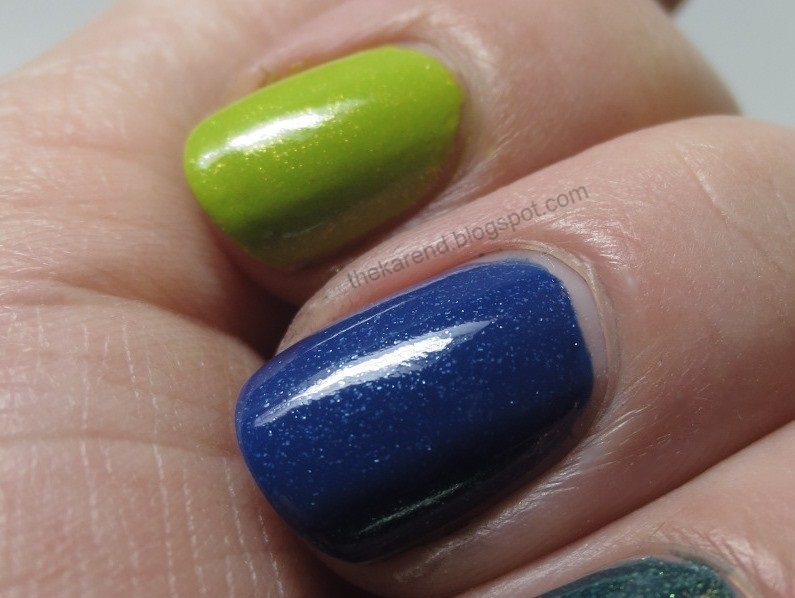 Amable Chartreuse has a golden shimmer, while Blue Spot has silver. River Green has brighter green and golden shimmer, and Chili Pepper Red has bright orange. I also got my first Kiko Quick Dry in those swaps; here's 834 Golden Tiffany, a light Tiffay blue with pearly golden shimmer. I did jot down how many coats I used of this one: 3. I didn't note that it dried super fast, but really with something so pretty, it doesn't really matter. It didn't dry super slow, and that's the important thing. The shimmer is fairly subtle, but does show up in regular room light. 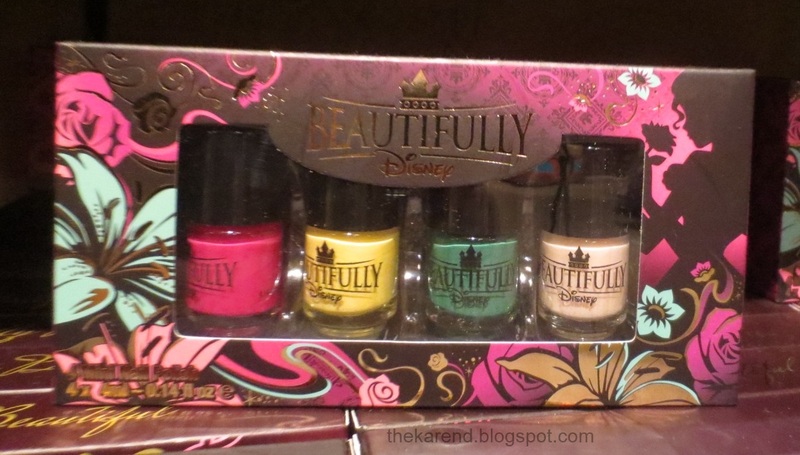 I really am spoiled, that I have so much polish to swatch that I forgot I'd done these. 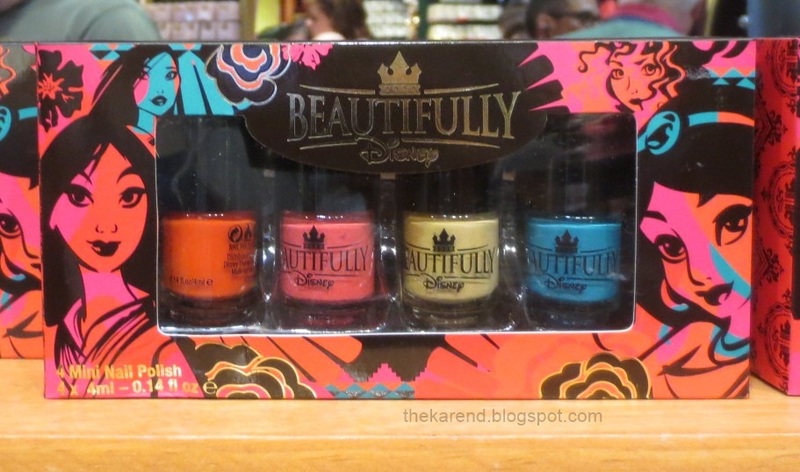 May I never take for granted that I'm lucky and blessed to have made connections with so many great people in the nail polish world that make it possible for me to grow my collection with beauties like these Kikos. Just a quickie today, since I am once again crazy busy at work. This is Nina Ultra Pro Gold Flake Topcoat, layered over a black creme. 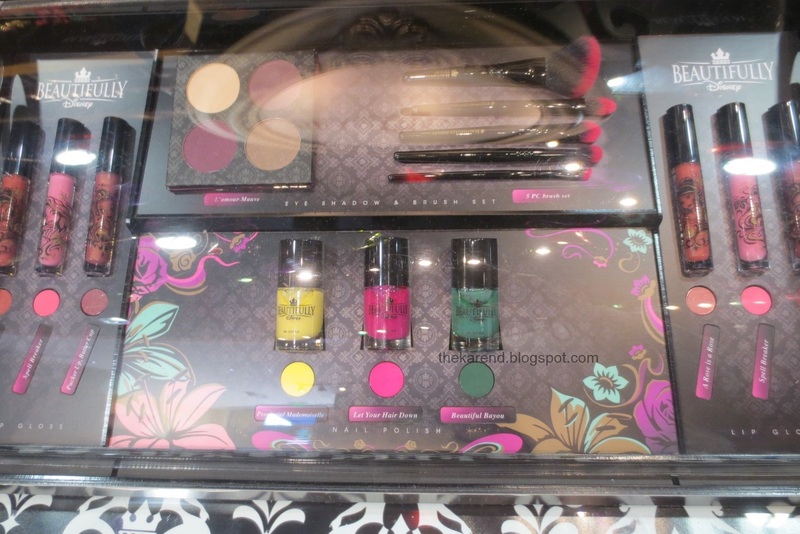 It showed up at Sally Beauty at the same time as the Nina matte topcoat I included in my last matte topper comparison, in the same twirly triangular section next to the core Nina display (yet another thing I'm behind on is getting display photos up so I haven't shared that one yet). This Nina delivers exactly what the name promises: gold flakes. Depending on the angle of the light, the flakes sometimes look quite dense and sometimes almost disappear. Also, at certain angles, I was sure I could see a hint of a green cast in them. 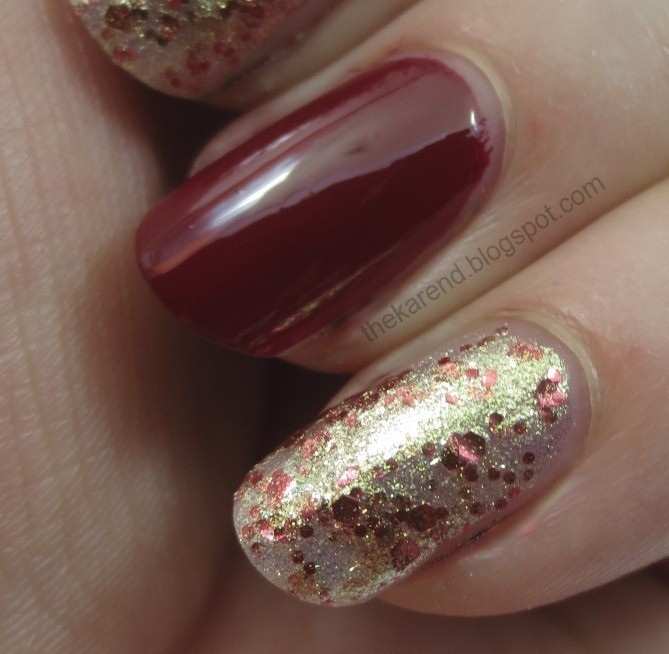 Though gold is not my metal, I liked this polish. Hi, I'm back! I spent most of my time away vacationing in warm and mostly sunny Florida (after stressing out about work right until just about the last minute before we left); Mr. Karen and I returned to cold and snowy Michigan Sunday night. As I mentioned before I disappeared, I expected to be in a new office as of yesterday, but while I was away, that move got postponed and is now scheduled for this coming weekend, which means I'm a bit disoriented right now since I packed up all my stuff before I left and it doesn't really make sense to unpack it all again only to repack it in a few days. Mr. K and I spent our whole vacation at Walt Disney World, riding rides, seeing shows, taking in the holiday decorations around the resorts and theme parks, and going to Mickey's Very Merry Christmas Party one night. 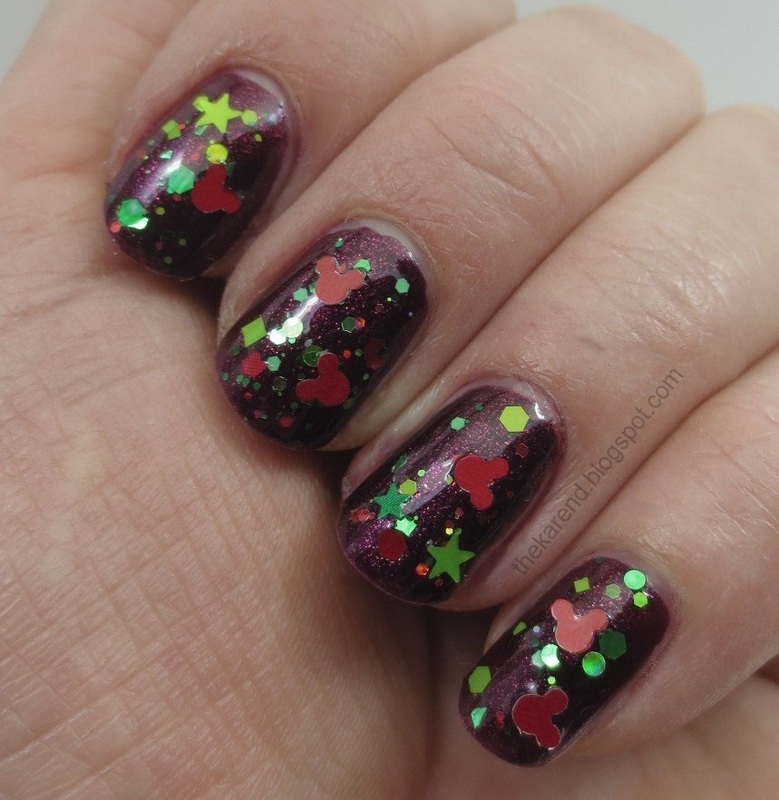 I found the perfect polish for it: Candy Lacquer Mickeys & Mistletoe, a red and green glitter mix in a clear base that includes Mickey Mouse shaped glitters. I layered this over Studio M Winter Affair, a wine shimmer (same as Color Club Winter Affair from last year's holiday collection). 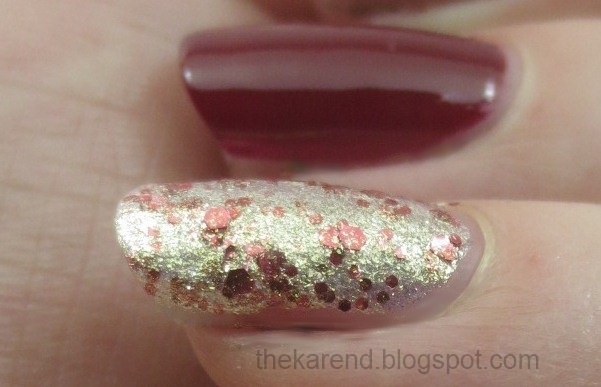 I tried out the glitter over red and green cremes, too, but the wine was best to let the glitter pop. Since I did this mani in a rush late at night, I didn't take good notes about how many coats I used. I think it was two of Winter Affair and two of Mickeys & Mistletoe, with some dabbing and skootching of the latter. 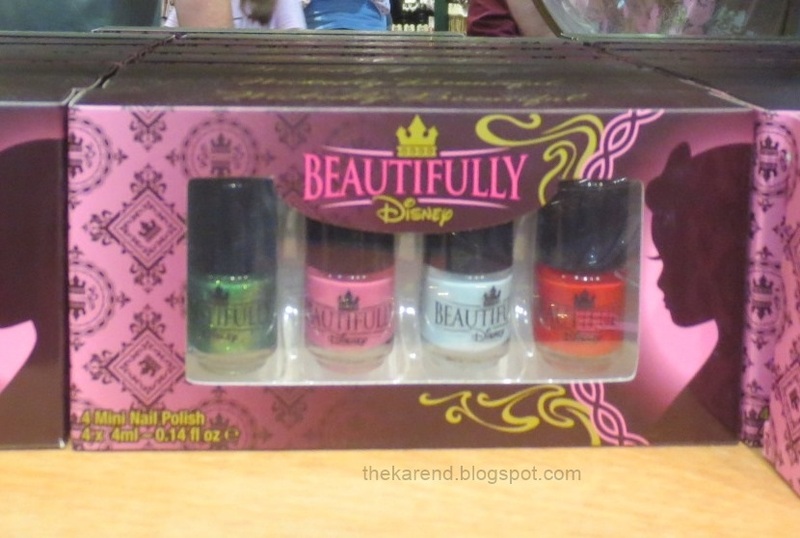 Candy Lacquer included a small bag of extra glitters, so I fished some extra Mickey heads out of there and plopped those on the wet polish. For a base, I used Salon Sciences Starting Over After Artificials, which I've been using even though I've never had acrylics and it does seem to be helping my nails feel stronger and peel less. 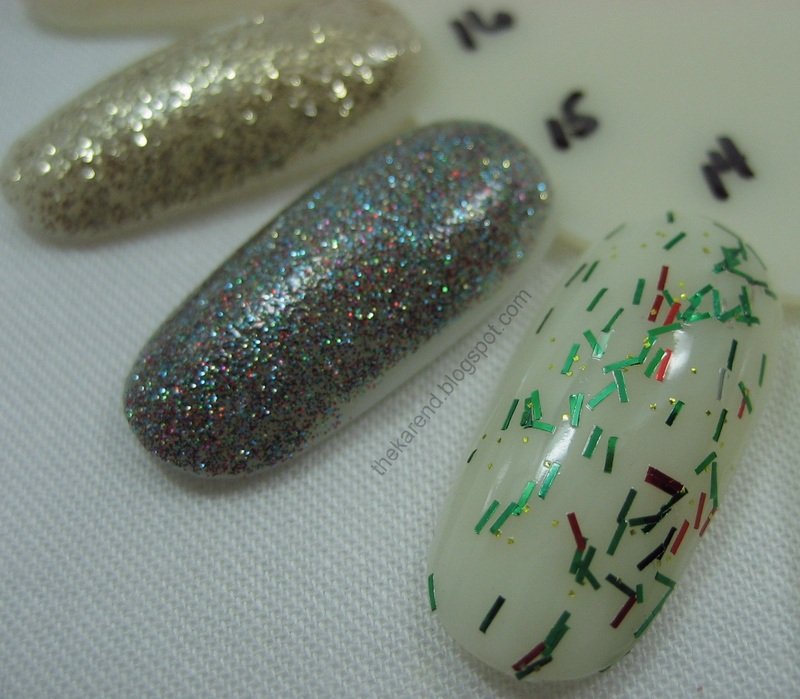 For a topcoat, I used Diamond Dry, which I think was not quite thick enough to cope with the bigger glitters but which I went ahead and used anyway because I trust it not to chip on me. My nails are pretty curved, so the wider glitters—Mickey heads and stars—didn't sit flush to my nails in all the spots I put them in. The first full day I wore this look, one of the Mickey heads popped off entirely, but that was easy to fix by plopping a dab of some smaller glitters there instead. As the week went on, a few of the ears on the Mickey heads lifted up. I probably could have stuck them back down with more topcoat, but I just clipped them off and let those Mickeys be lopsided; there was enough else going on that I don't think anyone noticed. A couple months back, my friend Mel (who writes at Delicious Color) sent me a surprise package with some polishes and a very fancy card she'd made by hand. I just recently finally got a chance to try one of the shades she sent, Orchid Grass Stains. 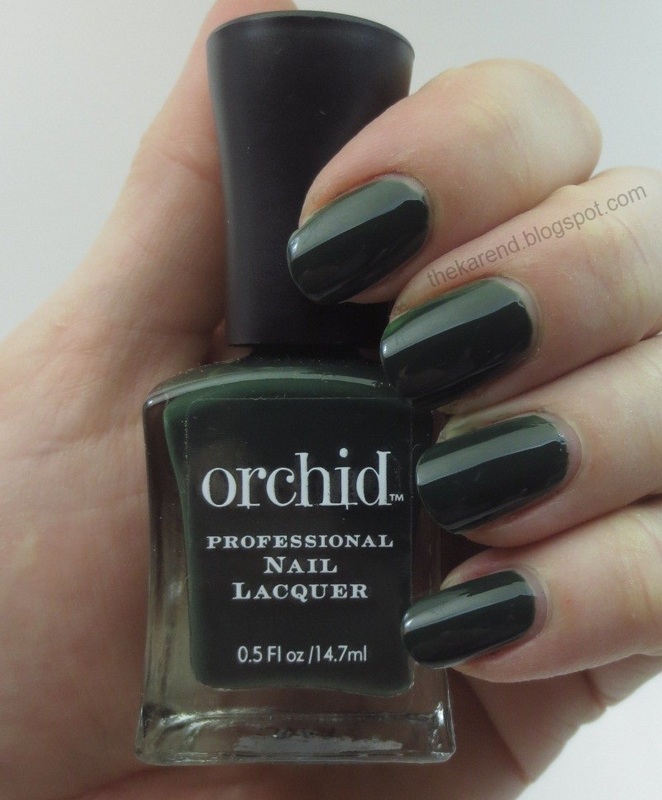 This is a deep warm toned green creme that needs only two coats for full coverage. I didn't use topcoat, and it didn't need it; you can see how shiny it is all by itself. 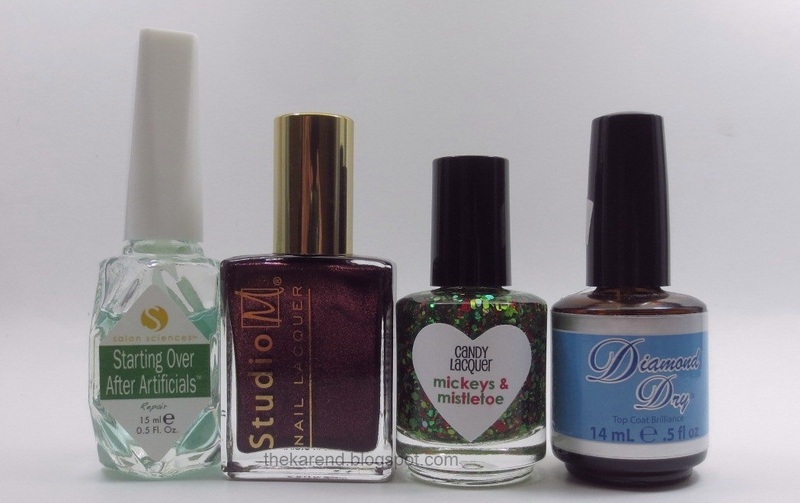 I liked Grass Stains on its own, yet couldn't resist the temptation to plus it by adding another polish I'd gotten from a friend, namely Purple Precious Stones Emerald, a green and holo glitter that was part of the swap I did with Under the Gravity's Nails. Not only did its colors coordinate with Grass Stains, it amused me that both brands were named for colors (and colors other than green at that: Orchid and Purple). 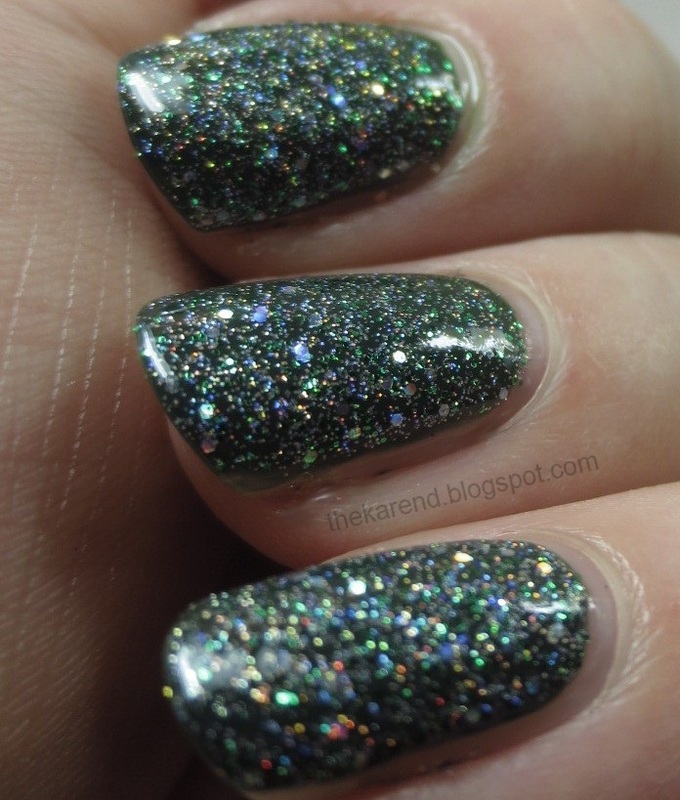 I was very pleasantly surprised to see how dense the glitter in Emerald was once I got it on my nail—one coat was plenty to get lots of sparkly goodness. I did add topcoat for extra shine and smoothness. 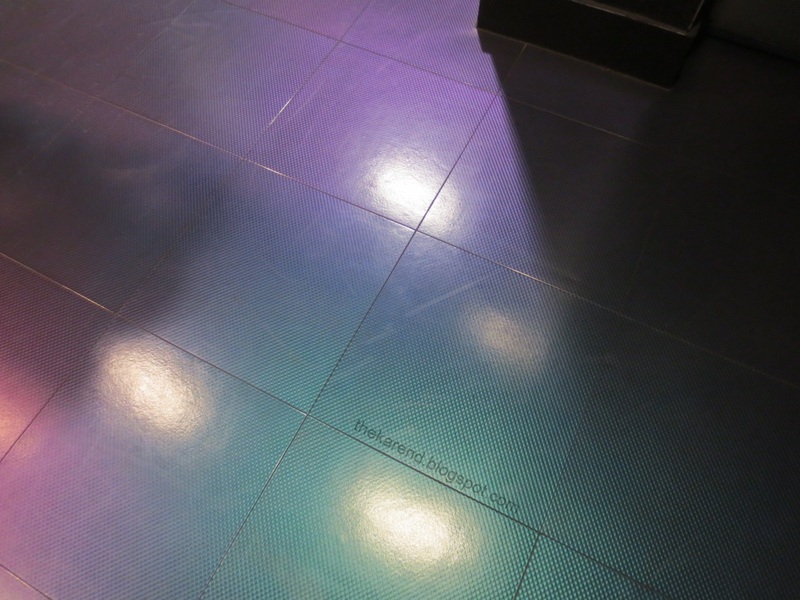 In slightly lower direct light, more colors popped from the glitter. I liked this combination a lot and feel blessed to have friends who send me pretty things like these. In addition to being blessed with an abundance of pretty nail polish in my life, my cup runneth over in other areas, too, so I am going to be taking another little break from posting here. I have too many other things pulling on my time right now, including a complicated office move to a new building. I have been promised that I and my computer and my furniture will be in my new office no later than the 16th, so somewhere around then I should be back here, too (unless my unpacking goes particularly badly or something). Hoping you all reading this are handling your holiday season stresses better than I am! 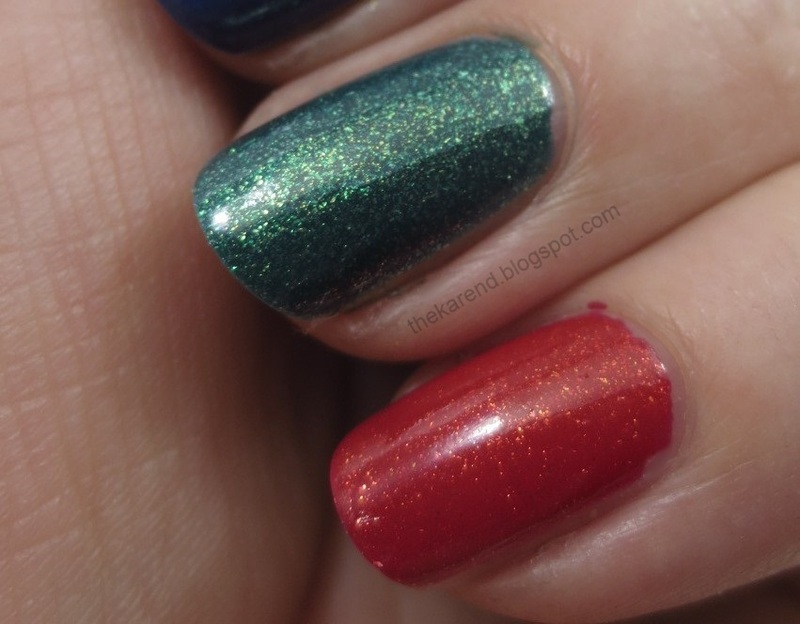 Since I did the FingerPaints holiday collection yesterday, I figured I'd continue the theme and share swatches of the Seche holiday colors today. Six shades here: Warm Hearted, Sparkle Click Kiss, Gracious & Kind, Nostalgic, Collected Moments, and All Lit Up. 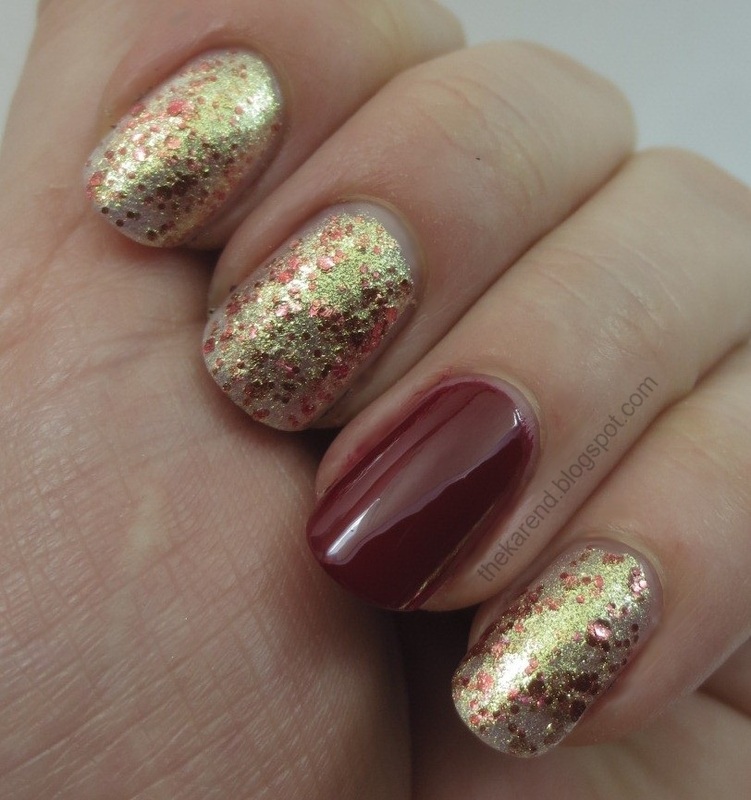 Warm Hearted is a darkish red creme, and quite honestly I was not excited about swatching a plain red creme, so I used it as an accent nail with the flashiest shade in the collection, Sparkle Clink Kiss, which has various sizes of red hex glitter in a shimmery metallic gold base. 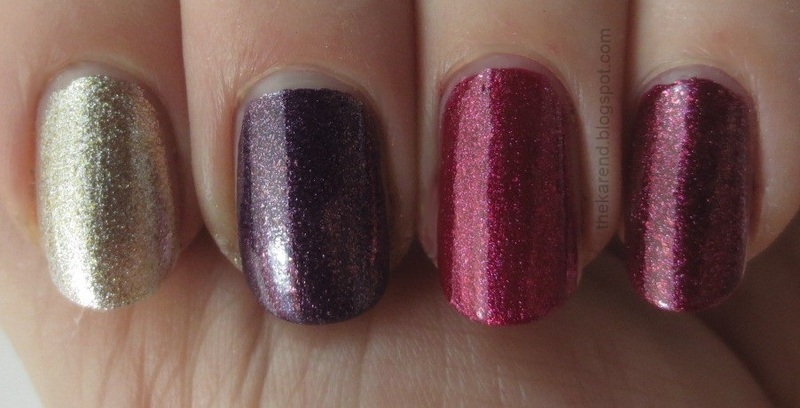 I used two coats of Warm Hearted and three of Sparkle Clink Kiss. 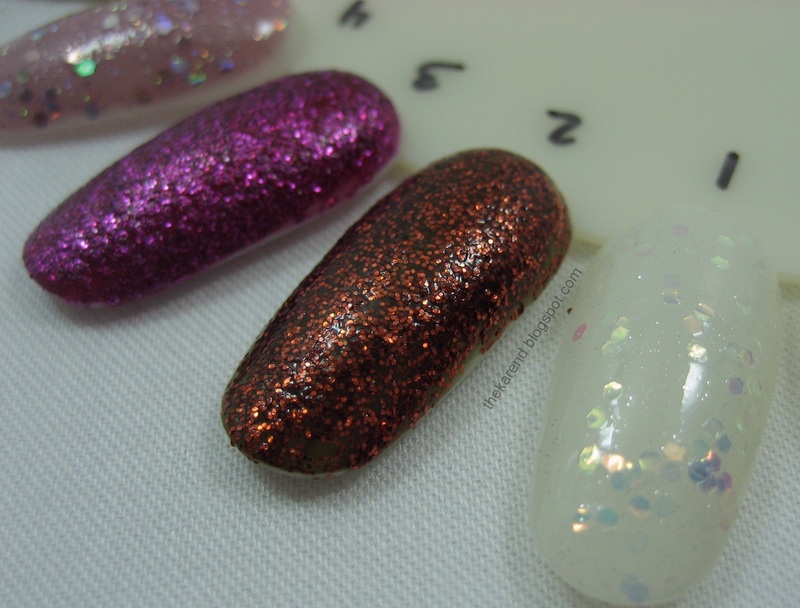 I left off topcoat; Sparkle Click Kiss does have a texture to it when worn that way, though with the glitter being large and not especially dense, it's more of a chunky type of texture as compared to the finer grained Zoya Pixie Dust style texture. 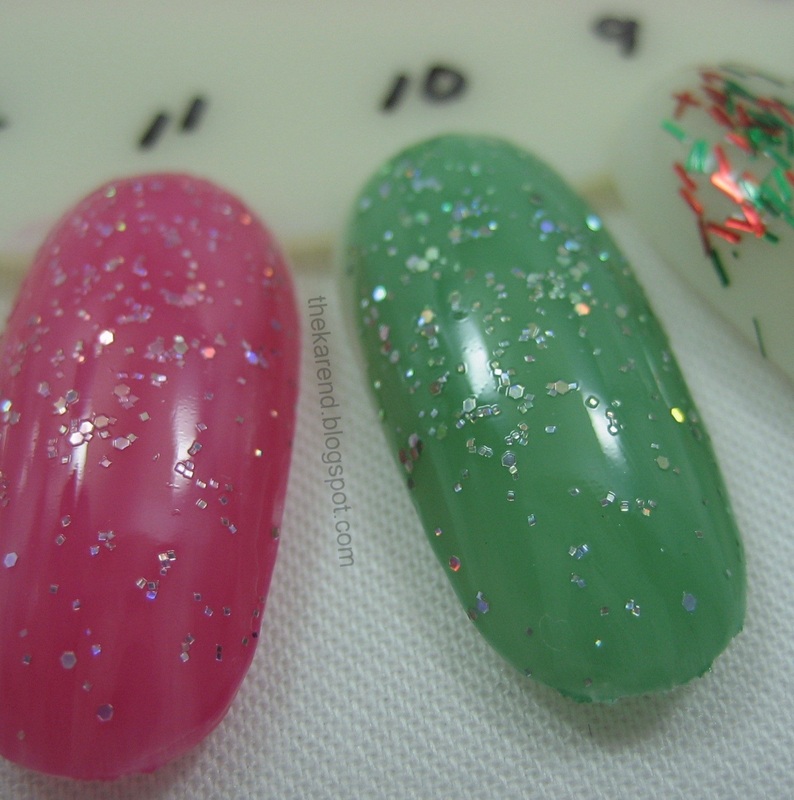 The hint of visible nail line under Sparkle Click Kiss showing in some of these photos wasn't that prominent in real life, but it does make me wonder how it would look over a colored base. 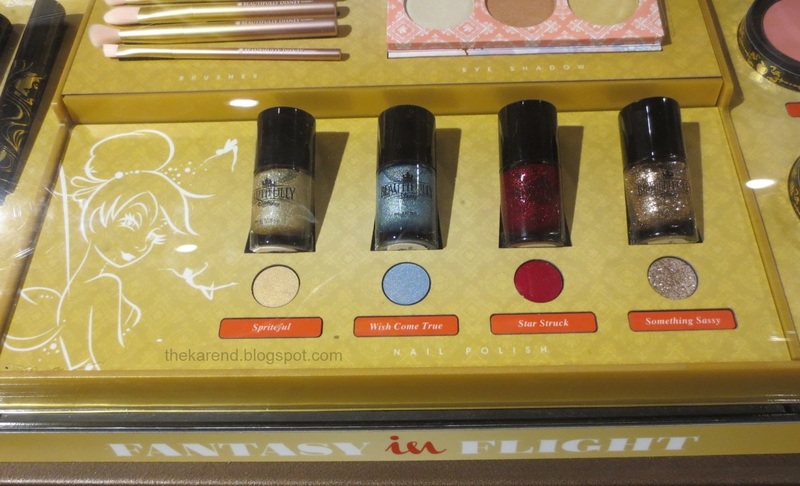 I wish that would have occurred to me when I was swatching, as I likely won't remember to try it out anytime soon, what with all the other pretties waiting for my attention. 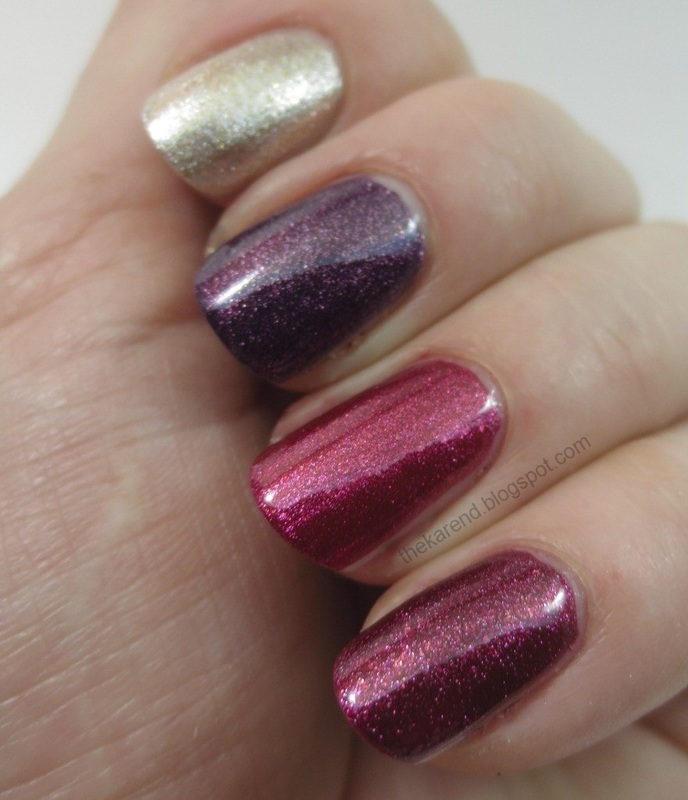 The other four polishes all looked to have a similar metallic shimmer finish in the bottle, so I wore them as Skittles. 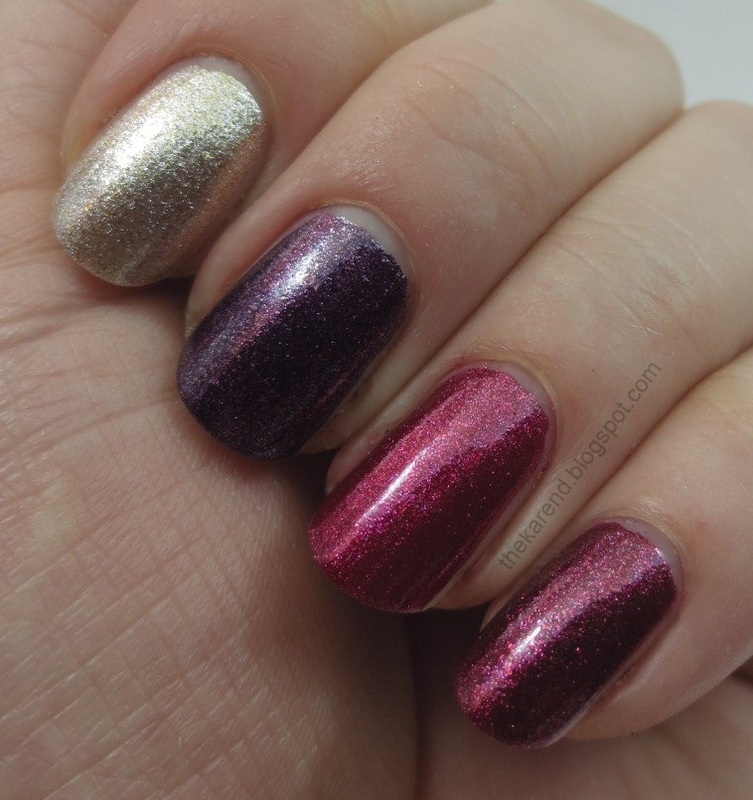 Left to right below: Collected Moments, Nostalgic, Gracious & Kind, and All Lit Up; all two coats, no topcoat. Collected Moments is a cooler, more silvery gold than the base color of Sparkle Clink Kiss. Nostalgic is a rich purple, so of course it's my favorite of this quartet. Gracious & Kind and All Lit Up are both berry reds, with Gracious & Kind being lighter and All Lit Up darker. 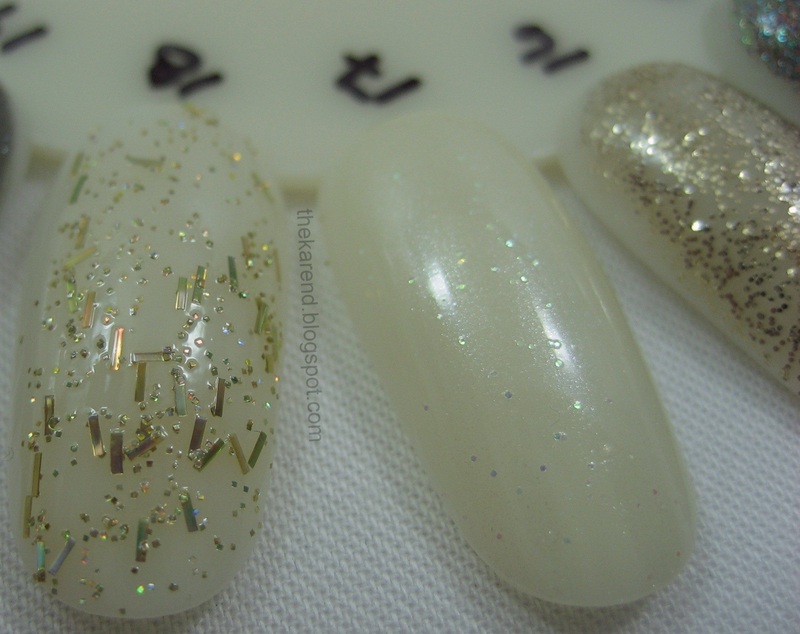 I thought all of these would benefit from topcoat, so I added some; it definitely made for a smoother surface and brought out the sparkles in the shimmer as shown below. 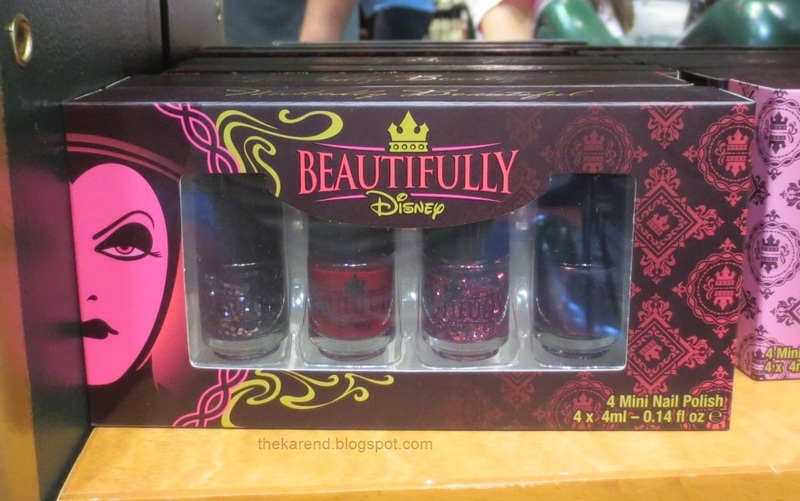 I think three reds in a six shade collection is too many; I'd cut out the darker shimmer and probably the creme, too. I'm also not sold on two golds in a group of six, but if it were silver, my preferred metal, maybe I'd feel differently. 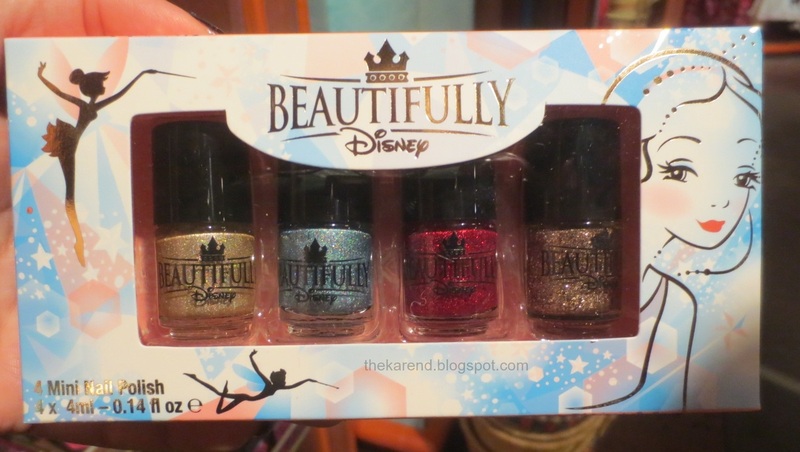 Maybe the gold shimmer was intended to be a base for the gold/red glitter. Wish I'd thought to try that, too.